At Cook Remodeling, we understand whether its a Phoenix kitchen remodeling project or Phoenix bathroom remodeling project, or in Scottsdale, or wherever you live, it is an important investment in your home and your life. We want you to feel confident and comfortable throughout the process. To help you in your decision making process, we’ve written a guide on choosing cabinetry. This does not include all the possibilities, but is a good foundation to get started. Cabinetry gives the predominant look of a kitchen, so typically is half of the kitchen remodeling budget. The quality of construction and finish should deliver both visual appeal and the home customization required to meet your needs. A professionally designed kitchen will have the right mix of options for the layout organization of display, storage and retrieval for meal preparation, cooking, for serving your family and friends. Remember to think out of the box! Beyond the kitchen, cabinetry can set a tone, make a statement, and be visually attractive in the bathroom, family room, office, library, dining room, bedroom, and even make the laundry room a great space to work. Whether you need a kitchen island, a custom entertainment center, or cabinetry for your walk in closet, the renovation can be designed for maximum value and use. With so many choices, features and brands available, this simple guide is to help you be more confident in knowing some of the things to consider in deciding what you want in cabinetry for the look and use in your home. 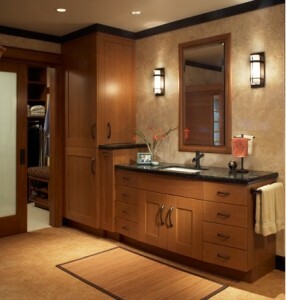 There are all kinds of companies producing cabinets for every kitchen and bathroom remodeling budget. An inexpensive cabinet may look adequate, but may not install and operate well, and could evidence problems that send it to a land fill in a few years. A well built cabinet can look new for years, and will be long lasting. If you want to examine your own cabinetry, or shop the market, here are some things to look for. Make sure the wood is solid, not spongy, without patches of wood and glue, and has clean cut edges. Look in and out, underneath, front, back. Are there gaps? Does everything look aligned and fit well? Avoid particle board (MDF) shelves and plastic clips for shelving. Check that the drawers slide mounts use metal brackets, and not plastic. Do the drawers have dovetailed joints? Press the drawer box with your thumbnail, it should not give. All sides of the drawer should be made of hardwood, and splinter free to the touch. Does it open and close easily? Does it fully extend? Have slow motion closing guides? You want the underside of the wall cabinet, and the ends to be finished to match the front, and not have a covered vinyl, which does not age well (they can peel, bubble, stain). Cabinets with a sufficient finish coating will feel smooth. Run your hands over the exterior doors, drawers, and side to see they feel the same smoothness. A basic, limited option box is called a production grade or stock line. They are mass produced in popular finishes, styles, and materials. The advantages are you can usually get these cabinets quickly (3-4 weeks), for they’re usually all ready made, sitting in a warehouse (which can be a disadvantage). There are few selections and sizes. They may be preferred for garage cabinets and closet systems. Cook Remodeling Tip: Some cabinet companies are so customer service minded that you can order production boxes for the majority of your kitchen, and a few semi-custom boxes for size or special features, no one will be able to tell, only you and your professional designer will know!!! This may help your budget so you can get the upgraded appliances or counter top that you have been wanting. A semi-custom line may be similar in quality to the production line, but with a wider selection in stylings, finishes, and accessories. Some customization is available, for it is made when the order is received. For example, you can get roll out drawers in base cabinets, pantries, and odd sizes to fit the space. It may take 4-6 weeks to be delivered. With popular grade custom cabinetry, most of the increased manufacturing cost is put into the cabinet’s exterior looks and finish. Additionally, there is a wider range of stylings, wood species, and stains. Often both framed cabinetry and frameless cabinetry is available from the same company. These products are suitable in other room applications such as a home office, library, bedroom or dining room. Delivery will vary from 6-12 weeks. Furniture grade cabinetry typically invests an equivalent manufacturing dollar in the interior construction, fit, and finish as the exterior. This grade is known best for its unique cabinet stylings. Delivery can be 10-20 weeks due to the attention to every step of construction. Face-framed cabinets are the most common cabinets in the U.S. In this construction method, the kitchen cabinets are made with a hardwood frame on the face of each cabinet to mask the raw edges and add structural integrity. When doors are installed, there is a gap between for the doors for the frame to show. Growing in popularity is frameless construction. Without the frame, your drawers are over and inch wider, and you have direct access to cabinets. No more edges to work around or try to clean. The cabinets are made like a box and covered with wood veneer, melamine or plastic laminate. Doors on frameless cabinets usually have very little gap between them, resulting in an unbroken appearance for the cabinets. You can get a traditional look with the added benefit of 10% more useable space with a frameless cabinet. That’s eco-friendly! A company committed to the quality of their cabinets will use their employees to build, finish, assemble, pack, ship, and deliver their work to the customer. That kind of service will be reflected in warranties for the length of time you own your home. Find out what is the quality inspection procedure of the company? Do they randomly pull a kitchen order every week to assemble on site and have the head of each process step scour it for any flaws? A part of customer service includes eco-friendly initiatives. Do they offer low voc (volatile organic compounds) finishes so your family’s home is healthier? Are they conscientious about the environment in what they do with their wood scraps? As a consumer, there are a number of options in finding the right cabinet for your needs and budget. There are home improvement centers and consumer buying clubs that market to embolden one to tackle the project on your own with their help. Laura Devlin, a design professional in Boston with 18 years experience, and a former short-term employee of Direct Buy has this advice, “…the notion that the member would save half on the purchase of cabinetry was not true. Savings on plumbing fixtures, appliances, etc. were not that significant either. Relying on the members to give the correct measurements and information was a stab in the dark. It is very difficult to design under those circumstances.” It is not uncommon to find design oversights, substandard installation, and insufficient customer service using this venue.